Staging area... Rafters preparing for their raft trip down the canyon. 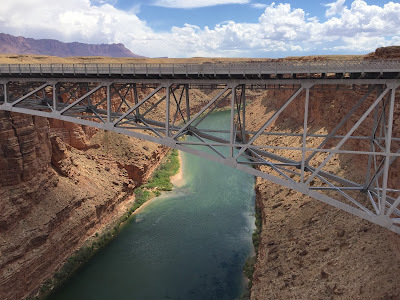 Lee’s Ferry - located about 8 miles south of Page AZ (& the Glen Canyon Dam) on the Colorado River. Here the river begins it’s twisting journey into the Grand Canyon. Rafters “Running the Colorado River” begin their trip here. 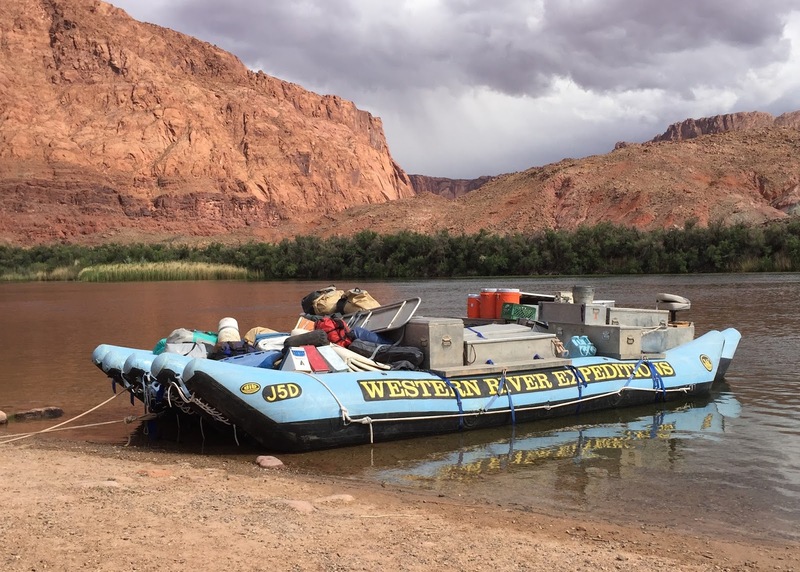 To protect the Grand Canyon and it’s beauty, permits are required to raft down the river, only a limited number are issued. There are 2 types of rafting trips, private and commercial. Private rafters can wait as long as 10 years for a permit. Trips last from 3 to 18 days. The 3 day trips involve a people exchange at the bottom of the Grand Canyon. A tour company flies people in and out of the canyon by helicopter to make the exchange. Lee’s Ferry got it’s beginning in the early 1870’s, the leaders of the Mormon church in Utah wanted to colonize Arizona, but the Colorado River blocked the way. Lee’s Ferry was the only place for hundreds of miles that a trail could be built to access the river (the Colorado for the most part has steep cliffs on both sides). In 1871 John Lee began his ferry operation and started a small settlement nearby. John Lee was actually running from the law due to his involvement in a massacre spearheaded by Mormons in Utah. He was arrested, tried and executed 6 years later. The ferry operation was passed onto another Mormon, the ferry service operated for 40+ more years. Ferry service ended as a bridge was completed over the Colorado. Raft loaded with food and camping gear. Tour companies supply the food (even prepare the meals) and all the camping gear needed for the trip, the gear is carried on seperate rafts. I talked to a rafter preparing for departure down the river the next morning. He was part of a private group with several rafters. They expected to be on the river 18 days, 225 miles to their take-out point. What an adventure. Bridge over the Colorado near Lee's Ferry. Hiking Cathedral Wash at Lee's Ferry. Great hike with part being in a slot canyon, some boulder scrambling required. The canyon hike was about 2 miles down to the Colorado River. Our timing was perfect, we reached the river just as several rafters were passing by. Lonely Dell Ranch - a Mormon settlement and home to families who operated Lee’s Ferry. The last private owners planted an orchard back in the 60’s. Today it is still maintained by the National Park Service, visitors are allowed to pick ripe fruit for their eating enjoyment. (Within limits and not to be re-sold). We picked apricots, the trees were loaded with the fruit, the orchard was beautiful and well maintained.